At the age of 60, Jo Milgrom became an assemblage artist, collecting junk from Jerusalem trash pails ("the discards of everyday life") and recycling her finds into new works of art. 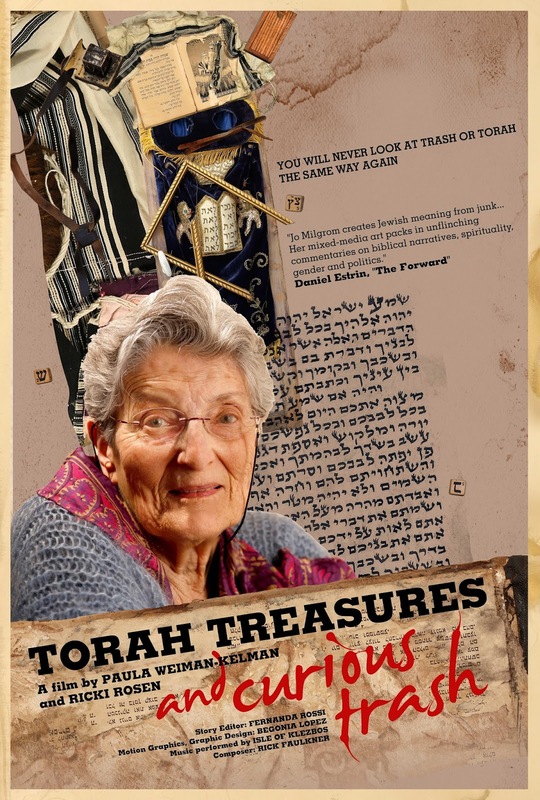 In a short documentary, Torah Treasures and Curious Trash, directors Paula Weiman-Kelman and Ricki Rosen offer a portrait of this learned and artistic woman and her unique vision of Jewish art. Today, Milgrom is 87-years-old and her Jerusalem home is decorated with dozens of pieces of her art. Years ago, she received a collection of abandoned ritual objects from a funeral parlor in San Francisco. Instead of letting them bury these objects in a geniza, she recycled them into works of art which are meaningful and extraordinary. Using tefillin boxes and torah mantles, and mixing them with ordinary junk, she creates art which is provocative, both religiously and politically, a type of visual midrash. For example, a few of her pieces deal with the sacrifice of Isaac, and one piece in particular is a political statement about our sons in uniform and how they are being sacrificed on the political altar. In another piece, she uses phone wires and attaches them to a tefillin box to show "voices" coming out of the box. Jo Milgrom is a mother, grandmother and great-grandmother. She is also an articulate and provocative artist who recycles everyday materials into new "works of creation." Torah Treasures and Curious Trash offers an extraordinary portrait of an iconoclastic woman who challenges the traditional uses of religious objects by imbuing them with new life. The film (24 minutes) is being screened this summer at the upcoming San Francisco Jewish Film Festival and is available from 7th Art Releasing. Thanks, Amy! Glad you enjoyed the film!